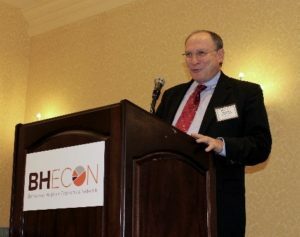 On November 9, 2017, the Association for Behavioral Healthcare, Massachusetts Association for Mental Health, and Blue Cross Blue Shield of Massachusetts Foundation, in partnership with the Behavioral Health + Economics Network (BHECON), hosted a forum on innovative practices for integrating behavioral health and the criminal justice system. 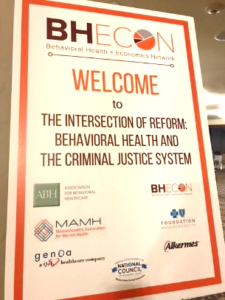 The forum, “The Intersection of Reform: Behavioral Health and the Criminal Justice System,” explored innovative approaches across the country and in Massachusetts to address the overwhelming number of individuals who enter the criminal justice system needing behavioral health treatment. The forum brought together over 100 attendees, including mental health and substance use treatment providers, police officers and criminal justice officials, state legislative staff, county and state-level government officials, and associations and organizations committed to improving access to the best care. Since 1980, the number of those incarcerated in the U.S. has tripled and people with mental illness are nine times more likely to be imprisoned. A panel of national experts shared their own experiences in leveraging existing funding from partner organizations to divert individuals from jail and reduce recidivism. 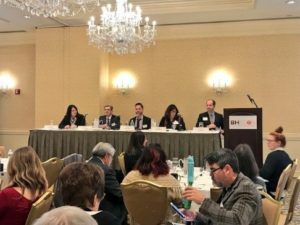 Panel members also acknowledged the need for more collaboration and budget-sharing among state agencies, as the communities are powerful leaders in reform efforts. 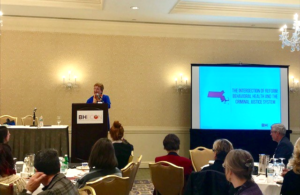 During her keynote address, the Commissioner of the Massachusetts Department of Mental Health emphasized the need to scale programs and services that are proven to work and invest in early intervention. While funding is always an issue, it is not the primary problem. In Massachusetts, for example, state government is not the barrier to implementing new ideas, but rather it is getting communities to rally around shared priorities. This echoed an earlier statement made by the national panel that if the community comes together, sets up common goals, and looks to treat those who are sick, funding will become available. The Commissioner also acknowledged the lack of available space in both substance use units and state hospitals and the shortage of affordable housing that contribute to many individuals becoming “stuck” in both the criminal justice and behavioral health care systems in Massachusetts. This prompted concerns and questions regarding affordable housing, specifically for individuals released from jails and prisons or for individuals who are homeless and are not receiving necessary services for mental health conditions, who then often cycle through the criminal justice system. In addition to the national perspectives presented by the morning panel, a panel of Massachusetts-based organizations highlighted innovative programs happening at home, building justification for future scaling across the state, including peer networks, re-entry services, MAT programming in jails, and police training and CIT programs. Panel members shared that recently 182 Massachusetts Police Departments have signed on to the One Mind Pledge to train 100% of officers in Mental Health First Aid and 20% of officers in CIT. They also expressed a need for more data, specifically related to reentry services, to persuade policymakers and said that it was difficult to work within legacy systems with non-normalized data. Attendees left with the data and knowledge to improve collaboration and combine efforts to expand diversion programs and reduce recidivism through access to treatment. As one attendee shared in a post-forum survey, “the Departments of Corrections, Public Health and Mental Health can no longer stay siloed in addressing critical issues at the intersection of behavioral health and the criminal justice system.” There is a desire among attendees to support Commissioner Mikula’s call to expand the programs that are working in Massachusetts and 86 percent of attendees responded they would be engaged in a unified rally cry for reform.